This collection examines the role of the just war tradition and its criteria in solving pressing present-day challenges. In particular, it deals with three types of challenges to world public order. One is anticipatory self-defense, in which one state attacks another to pre-empt or prevent an attack on itself, as the United States claimed in relation to Iraq in 2003. The second challenge is humanitarian intervention, in which one state attacks another to stop gross, large-scale violations of human rights, as NATO claimed to be doing on behalf of Kosovo in 1999. Both practices may erode world public order, given the normative strength of Article 2(4) of the UN Charter prohibiting the threat or use of force against other states. However, both practices pose dilemmas, in that they also preserve world public order by not allowing impunity for human rights abusers or the misuse of international law to the advantage of genuine aggressors. The third challenge is the execution of warfare in a new geopolitical environment characterized by new technologies and asymmetry of belligerents. The chapters in this book, written from a variety of disciplinary perspectives, turn to the just war tradition to attempt to resolve these tensions. 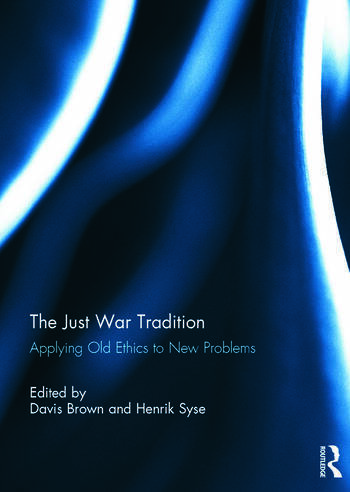 This book was based on a special issue of the Journal of Military Ethics. Davis Brown is an assistant professor of political science at Maryville University of St. Louis, USA. He is the Director of the Just War Theory Project, an interdisciplinary network of scholars studying the role of just war theory in the maintenance of world public order. Henrik Syse is a senior researcher at the Peace Research Institute Oslo (PRIO), Norway, and also teaches ethics and military affairs at the Norwegian Defense University College and at Björknes College, Oslo. He is co-editor of Journal of Military Ethics, with Martin L. Cook.